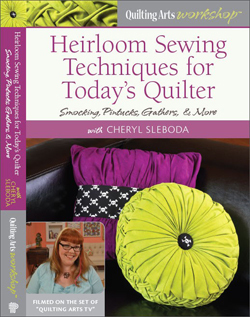 blog – Page 6 – Cheryl Sleboda – Textiles. Technology. Texture. Teacher. 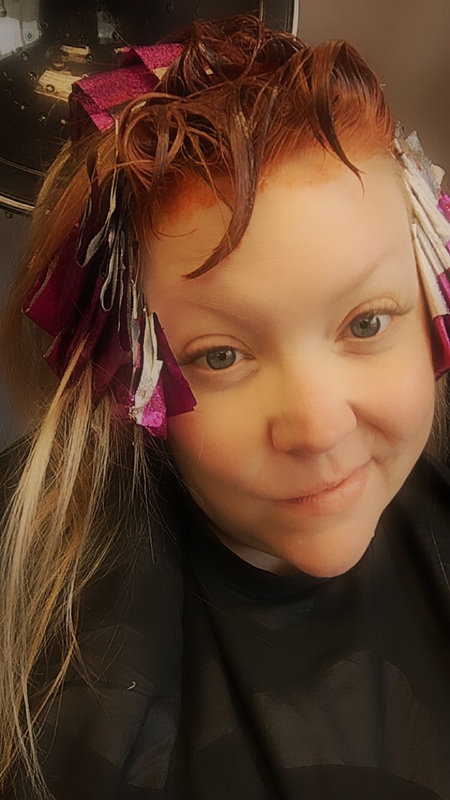 Day 4 – No rest for the wicked. Dec 04, 2018 Muppin Comments Off on Day 4 – No rest for the wicked. When you’re constantly on the run, you need to figure out some basics. Like when to schedule hair appointments or remember to buy food so you have something to eat when you get home. Unfortunately I have yet to master these skills as I’m out of food and getting my hair done at a crazy hour because it’s the only time I have free. One thing I know is that my machine needs a spa day. It’s getting a workout these last 24 hours to finish some special projects for a secret thing this week. It looks like a sewed through a unicorn in there. I can’t exactly say WHERE I’m going next just yet, but I promise you it’s cool. Here’s a sneak peek. The busy season of travel is almost over and I promised myself some time off to work in personal projects, but that doesn’t seem likely just yet. All this travel means my studio and my office are in absolute states of horror. 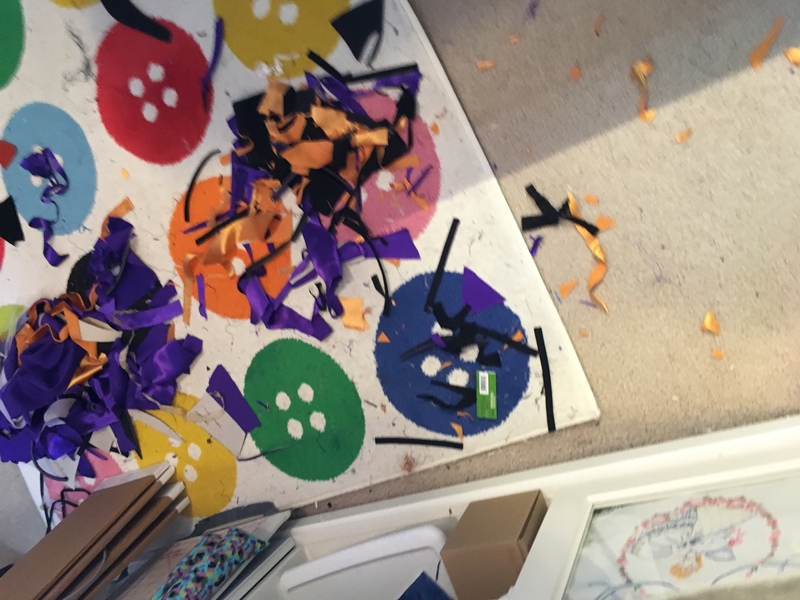 I always said I was a messy sewist. My poor carpet! 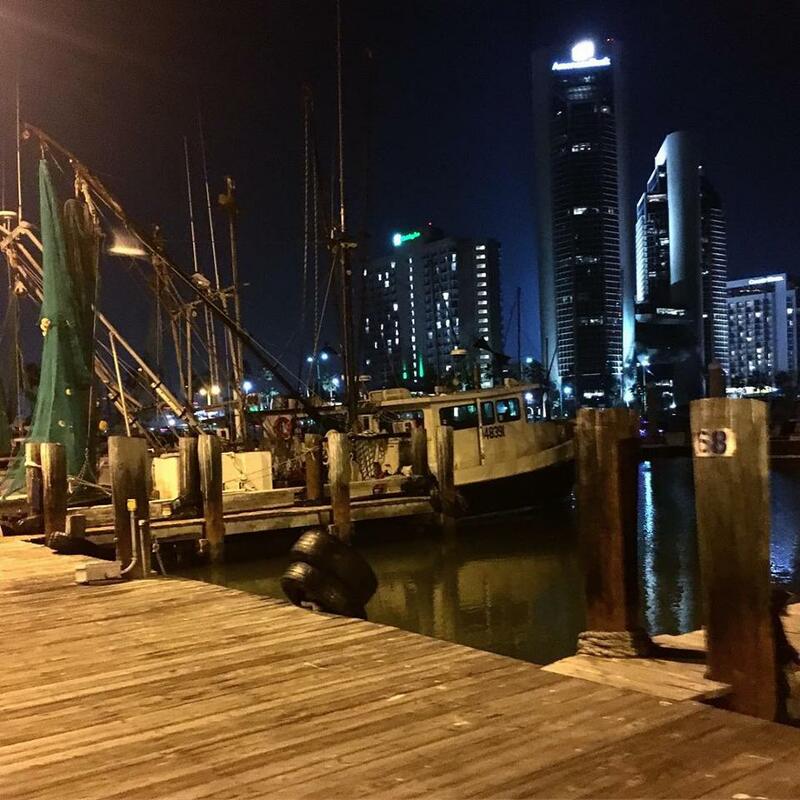 Day 2 – Corpus Christi and home again. 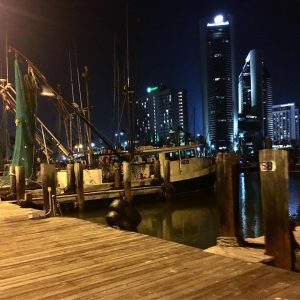 Dec 02, 2018 Muppin Comments Off on Day 2 – Corpus Christi and home again. I spent a day yesterday in Corpus Christi TX at a great store called the Singer Sewing Center. 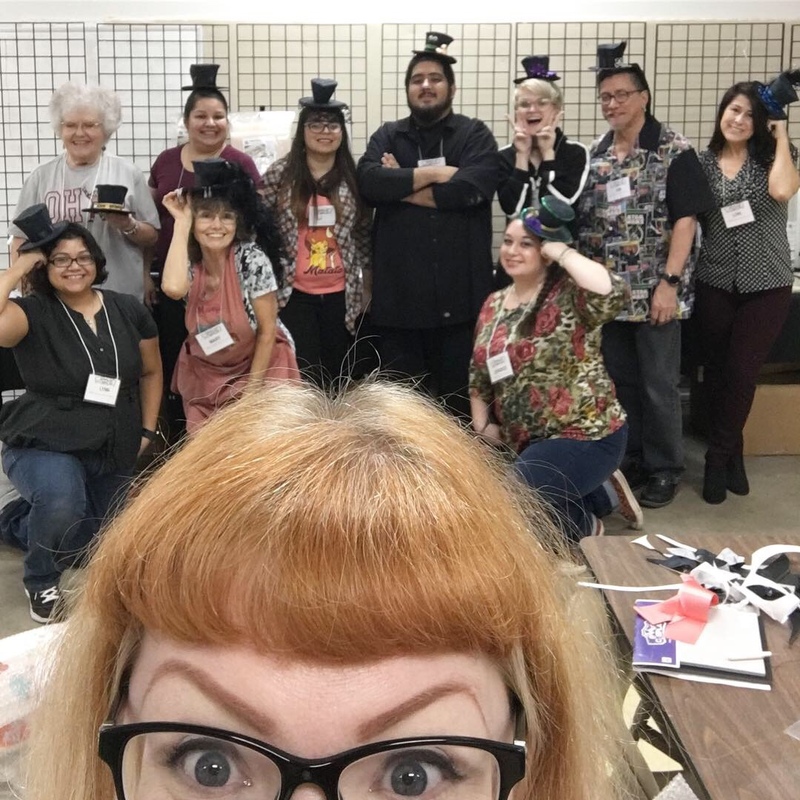 They brought me in to do a cosplay class, and we had a great day making little mini top hats! I love how happy everyone was with their hat in this picture. 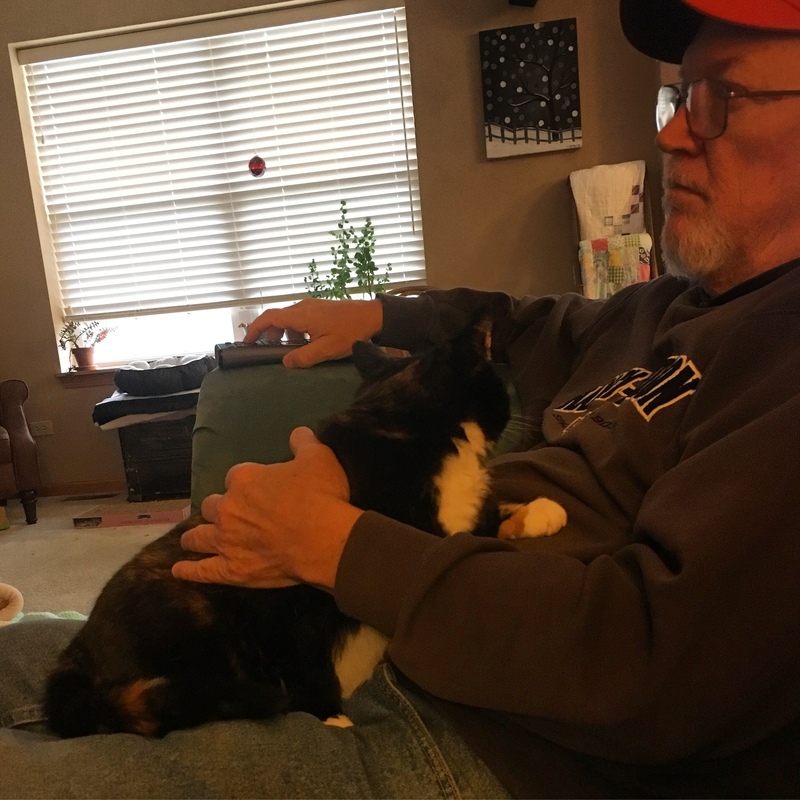 I’m back home already and this is proof that I’m losing the war for my cat’s affections with my dad. There’s been a lot of travel lately and he’s been filling in at home. One more big trip coming up… and then I’m home for a couple of weeks. Stay tuned for the details on the next trip! Day 1 – 31 Day Blog Writing Challenge 2018! Dec 01, 2018 Muppin Comments Off on Day 1 – 31 Day Blog Writing Challenge 2018! Hello everyone! It’s not too late to sign your blog up for the 31 Day Blog Writing Challenge, as the link is open HERE until Dec 10th. I’m really excited this year and I hope you check out the many blogs on the list who are participating! I’m currently in Corpus Christi Texas, proving you can basically blog anywhere! 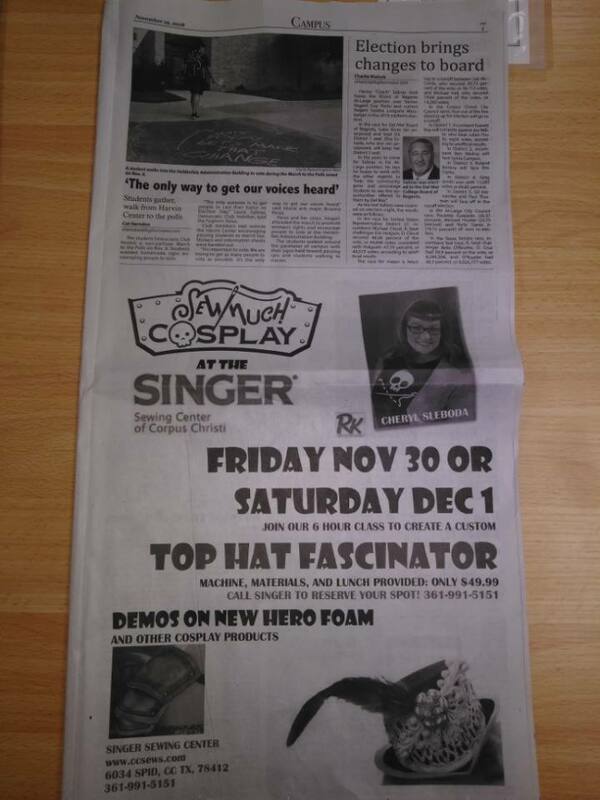 I’m here to teach a Cosplay class for a great store called Singer Sewing Center of Corpus Christi. We are having a great time. I have so many things to share with you this month during the blog challenge. I hope to see one of your blogs among the challengers! More on Facebook Quilt Scams! 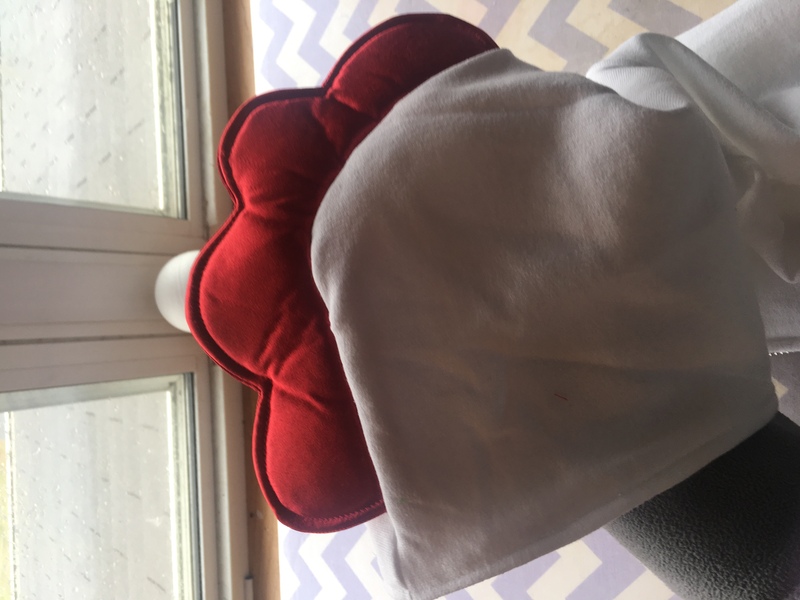 Nov 28, 2018 Muppin Comments Off on More on Facebook Quilt Scams! First off, THANK YOU to everyone who is sharing and getting the word out about these SCAMS. They mostly prey on the non-quilter, so it’s up to us to see these scams for what they are and REPORT them. My previous article on this shows you how to report a scam ad when it comes across your feed. Since then, not only have famous quilters like Ricky Tims and Laura Heine discovered their quilt images being reproduced in the ads. Laura ordered the quilt and it eventually did get sent to her but it was such and awful, cheap reproduction. Now, a real quilt shop has been caught up in the fiasco. 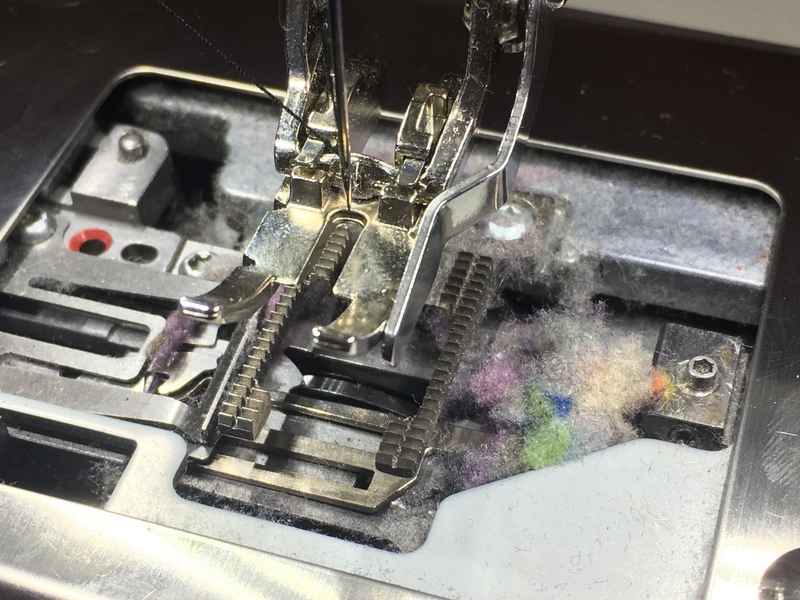 The quilt shop (Gigi’s Fabric Shop) is unfortunately closely named to one of the scam websites, and she has been receiving calls from frustrated buyers who have been scammed. She even appeared on the news about it. There’s a great list of Facebook pages that have been discovered to be part of the scam, which you can see HERE. This Facebook user, Cindy Santa Anna, has compiled this awesome list of scam Facebook accounts and websites that just take your money and send you nothing. Keep up the good fight, Cindy! 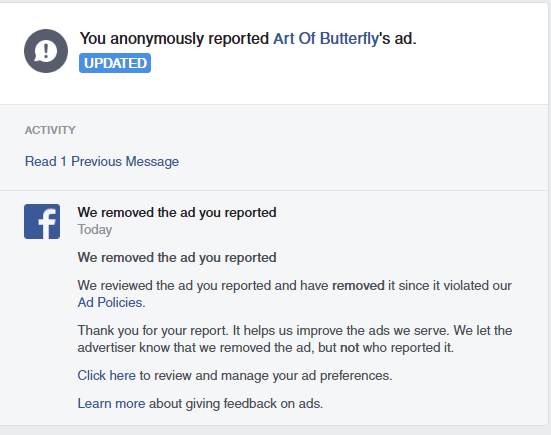 Like you I have been frustrated that Facebook not only doesn’t remove the ad because it “doesn’t violate policy”, they let the business’ Page remain online to continue to run different scam ads instead. So in my frustration to one of the replies I got from Facebook, I used the little “Happy/Unhappy” faces to rate their response. When I did that, it gave me a space to reply, and lo and behold, that ad was removed because I told them it was a real scam! 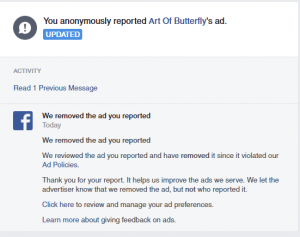 What we need now is for all users (this means YOU) who see a scam ad to REPORT IT, and if you do not get the ad removed when Facebook replies, use their rating system to tell them why you are unhappy with the response, and tell them that the PAGE and AD both are perpetrating a scam. Cindy’s list is a great place for Facebook to start. Facebook has to deal with hundreds of thousands of reported ads everyday, so I can understand a small amount of the robotic feedback we get that says the ad doesn’t violate their policies. You would think with a newscast and the many reports they would investigate the Pages and deactivate them. This is a fight for both the original quilt designers, like Ricky and Laura, who have found their work being illegally reproduced, and also for the millions of unsuspecting non-quilters who think that a “blanket for $60” would have made a great gift. That undervalues the work of millions of real quilters who would never sell a big “blanket” that low. Plus, scammers should just plain not get away with it! So, fight on my friends! We can make a difference!